THE detestable superstition of St. Cyprian's idolatrous parents devoted him from his infancy to the devil, and he was brought up in all the impious mysteries of idolatry, astrology, and the black art. When Cyprian had learned all the extravagances of these schools of error and delusion, he hesitated at no crimes, blasphemed Christ, and committed secret murders. 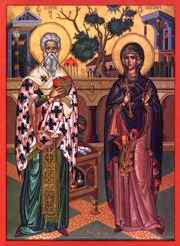 There lived at Antioch a young Christian lady called Justina, of high birth and great beauty. A pagan nobleman fell deeply in love with her, and finding her modesty inaccessible, and her resolution invincible, he applied to Cyprian for assistance. Cyprian, no less smitten with the lady, tried every secret with which he was acquainted to conquer her resolution. Justina, perceiving herself vigorously attacked, studied to arm herself by prayer, watchfulness, and mortification against all his artifices and the power of his spells. Cyprian finding himself worsted by a superior power, began to consider the weakness of the infernal spirits, and resolved to quit their service and become a Christian. Agladius, who had been the first suitor to the holy virgin, was likewise converted and baptized. The persecution of Diocletian breaking out, Cyprian and Justina were seized, and presented to the same judge. She was inhumanly scourged, and Cyprian was torn with iron hooks. After this they were both sent in chains to Diocletian, who commanded their heads to be struck off, which sentence was executed. Reflection.--If the errors and disorders of St. Cyprian show the degeneracy of human nature corrupted by sin and enslaved to vice, his conversion displays the power of grace and virtue to repair it. Let us beg of God to send us grace to resist temptation, and to do His holy will in all things.